Note: I open this review by quoting one of the last lines of the film, and I end it with a discussion that could be construed as a spoiler, so if you want to go in completely cold, this review will be waiting for you when you get back. Cooper’s A Star Is Born is the fourth of its kind, a remake of a remake, of a film that dates back to the first decade cinema even had sound to call forth the music. These notes have been played before, and they will be played again, and whether or not you’ve seen one of the four film versions of this story, you’ve doubtlessly absorbed it as a piece of American culture, as an archetypal narrative played out again and again in films and musicals and television shows with and without this title. One star rises as another star falls, and when their trajectory meets in the middle, they briefly burn brightest. The notes aren’t new, but what Cooper and company have to offer the world in the way they see those notes is something special. The familiarity isn’t a bug, but a feature, because there’s something embedded in this narrative that has struck a chord with audiences for generations, and this film plays that chord with nothing short of a virtuoso performance. 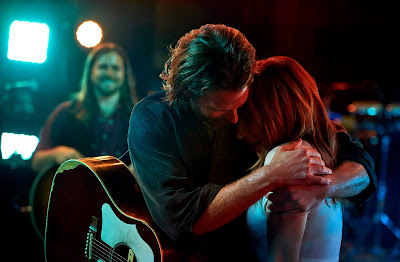 A Star Is Born is one of the great films of my lifetime. Hyperbole, perhaps, but words I feel completely comfortable typing, buoyed by the images flashing through my head, by the songs pounding their way through my heart, by the waves of full body sobs that radiated their way through the packed opening-night auditorium still echoing in my ears. Imagine the most soulless, crass commercial cash-grab version of this movie that you can – the kind of vanity project you might have imagined when you heard Warners was handing this remake off to one of their top stars as his first directorial effort – and then imagine its exact qualitative inverse, a film of such immense heart, empathy, and skillfulness that one can scarcely believe it got made in the 2018 studio system. That should put you somewhere in the range of what Cooper and company have pulled off here, though it’s no substitute for actually watching the film, in a theatre, on a giant screen, with a big crowd, all together on a communal journey of being won over by the sheer enormity of the film’s emotional depth. I will admit that I’m an easy mark for what Cooper is attempting here, for while I’m not a fan of movie musicals in general, I am an absolute sucker for films about music, where the characters are performers and the music is a diegetic part of their lives and journeys. The Commitments, Nashville, That Thing You Do, Inside Llewyn Davis, Once – films where music and its periphery are the air the characters live and breathe, the thing that fuels them, the force that animates them. The full synesthetic powers of cinema, still so frequently untapped despite the limitless tools at our disposal, can come so fully to life when one places a character within a world and has them sing or play an instrument, expressing their interiority through sound, combining two languages – music and cinema – that are truly universal. Music is a part of our world, a fact of our lives, a companion and an outlet that carries us through the days, tempering our emotions and bringing us closer to ourselves and to others. A film that can incorporate that truth into its being, not as a gimmick but as a core part of its essence, is destined for a particular kind of greatness – the kind that bypasses the head and pierces us right in our soul. 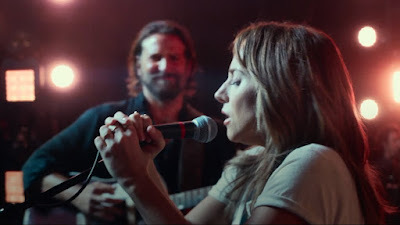 A Star is Born is one of these films, a movie where music is such a core part of its being that to think of the film is not only to hear the songs playing again in one’s head, but to feel the way they first struck you evolving in your heart. Cooper’s casting of Lady Gaga, then, is one of the film’s many strokes of genius: One of the few talents prodigious enough to chart the character’s meteoric rise to fame without ever calling the film’s internal reality into question, and one of the fewer still surprising enough to astonish us as a person, not just a performer. Her work here is extraordinary, a three-dimensional portrait of a person hidden from themselves, blossoming into being from the simple power of being seen, and by an embrace of talent and creativity. 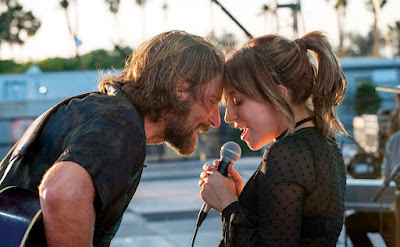 Gaga pours so much of herself into the role, particularly in the film’s second half when the character’s public persona starts to look more and more like the chameleonic pop star, but the performance is so complete one is never removed from the reality of the piece. Particularly when she sings, Gaga is constantly shaping her character, breathing life into this creation with the usual tools available to all great actors, and to those reserved for someone with one of the fullest, most dynamic voices on the planet. It would feel disingenuous to call anything Lady Gaga does a true surprise at this point, so many times has she astonished us with a deeper well of talent than we’d seen before, but her work here is indeed a revelation. So to, and indeed to an even more astonishing degree, is Bradley Cooper, both behind but especially in front of the camera. I’ve always thought Cooper was a good actor, a naturally charming personality who in certain moments – Silver Linings Playbook, Guardians of the Galaxy – gestured towards something more than an above-average movie star. I would never have expected this. Cooper’s performance here is towering, a fully embodied portrait of a man in pieces, assembling and disassembling before our very eyes. He takes this ‘tortured artistic male genius’ role, one that should be rote beyond salvation at this point, and imbues it with such bottomless pathos that what one sees on screen feels inexorably human. The film’s portrayal of alcoholism and addiction is raw and messy and genuine to a shocking degree, and the way Cooper so deftly traces both the lows and, crucially, highs of this man’s life is palpably, painfully real. The good he embodies in one moment – the charm, the talent, the open-hearted need to share his life and world with those he loves – and the ugliness he descends to in another – jealousy, vindictiveness, a drunken disembodied stupor – are not two men in the same body, but one man on a perpetually uneven path, as such people are when we encounter them in the real world. It’s the complexity itself that hurts, the inability to reconcile the good and the bad of this person we love, the impossibility of truly accessing their mind or heart and healing whatever has been broken. That is the character Cooper conjures here. It hardly feels like a character at all. I mentioned earlier the simple power of being seen that sparks the evolution of Gaga’s character, but it goes both ways for the two figures entwined at the heart of this story. Initial advertising for A Star is Born raised more than a few eyebrows for the seemingly stock, surface-level exchanges between Cooper and Gaga depicted in the trailer – him telling her she’s beautiful, her mouth agape in shock – that felt like a relic of another time, a different remake. The film itself is anything but, its depiction of this relationship built and developed not on surfaces, but on empathy. Cooper and Gaga’s first impromptu date, a stupendous sequence, is not about the man telling the woman she is beautiful, or removing her makeup to see some true visage hidden by society, but about two people actually looking at each other, seeing each other, and being seen in turn. Seen as a singer, a songwriter, an expressive soul, a person with a voice the world is less than whole without; seen as an individual, a personality, a thoughtful man the world has calcified in a veil of fame. They look at each other, they see these things, and in having those things seen, they come in closer contact with their own humanity – which, of course, is what human relationships are all about. As the eyes of the film itself, cinematographer Matthew Libatique delivers his greatest work since Darren Aronofsky’s Black Swan. Next to Emmanuel Lubezki, no working cinematographer displays greater mastery of the mobile frame than Libatique, and like in Black Swan, his work here is at its most transcendent when his camera follows the characters on stage, inhabiting their world of performance with a startling degree of immediacy and intimacy. His camera is sensual, embodied, expertly composed but in perpetual flux, not unlike the characters he captures. A POV shot early on, of Gaga’s character looking through a curtain at Cooper performing, quite literally took my breath away. A Star Is Born concludes on a particularly wrenching emotional crescendo, and if you have seen any other version or picked up the basics from the cultural ether, you will know why. It will still not prepare you for what Cooper has prepared here. This film got me misty-eyed early and often, but I thought I was holding it together pretty well at the end, compared to some of the sobs around me. Then Cooper makes a cut. That goddamn cut. You’ll know it when you see it. It is the film’s masterstroke. In thirty years, when this film is rightfully viewed as a classic, being taught by old people like me, it will be one of those cuts we show to illustrate the simple power of editing, cinema’s first and greatest special effect. It will demolish you. It will be talked about forever. A star has indeed been born – do yourself a favor and see it now, with others, in the crowd, where it will burn brightest.